NOW BEING OFFERED AS A FREE GIFT. Email us at restplmin@yahoo.com to receive your password for opening your E Book. This E Book is being offered as a Free Gift and a blessing to you. It can be sent to your friends, given away as a bonus with other products, or distributed in any manner, as long as it is delivered unchanged via this file and as long as it is not sold at any price. Thank you..Keith A. Paul. 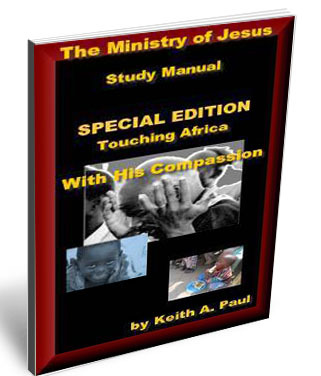 May the Lord pour out His Presence and Provisions as you read through this book. Save As options to store this on your computer. If it opens in full screen mode, press escape on your keyboard so the save features are visible. If you do not have Arcobat Reader then go to www.adobe.com and download it. You will need this or a similar program to open this PDF. You will receive your password in a separate email to open your EBook. Instructions: *You can read this file from the beginning or select pages (click on Pages tab) from the thumbnail section on the left side. *You can also listen to it by selecting “Read out Loud” from the View Menu. *This is also tagged for text flow on Hand Held Devices. Follow the instructions for your specific Device to Load to the Device. PDF Files when opened By Adobe Reader can be read or you can listen to them by going to Read Aloud under the View Menu.